You can use an ax for wood splitting, but a maul is more appropriate. A maul has a bigger head, is more efficient and splits wood faster than your ordinary ax. If you are ready to get the best spitting maul, there are several things that you should know, and that is what we are going to do below – don’t you love us for it? You deserve a splitting maul, worth your time and investment and Husqvarna 32″ Wooden Splitting Maul is one that fits the description. It gives you all the power you need to complete your wood splitting task effectively. But what makes the maul so good? For starters, the maul features high-quality steel from Sweden. That means the ax can quickly take the shock from the hardest of wood and last a long time. The sledgehammer end can quickly take down a concrete structure, as well as other hard surfaces. The best need no introduction, and that is what Fiskars Iso Core 8 lb Maul 36 Inch, 751110-1001 is all about. There is a good reason why the maul has so many positive reviews, and it is, of course down to quality. The maul comes with a rugged and sharp edge for splitting wood and a driving face for driving wedges – it is a 2-in-1 tool. It also has an innovative shock control system that absorbs all the striking shock for comfortable use. Fiskars makes a comeback with another top quality maul to keep your supply of wood for heating, consistent. For starters, the maul has a perfect balance that makes it efficient in swinging and striking. It has unmatched blade geometry for easier wood penetration and removal – it is a joy to use. Well, the lightweight may be a shortcoming for some users, but there are those that would prefer it. As opposed to a wooden handle, a fiberglass handle outlasts its counterpart comfortably. Tabor Tools J55A Splitting Axe, 35 Inch Wood Splitting Maul also features advanced blade geometry for easy penetration and removal from wood. The shape of the blade also gives you the benefit of a single strike when splitting pieces for your fireplace. The non-slip rubber grip reduces the effects of strike shock, and you can use it for longer. The hickory handle maul is another good choice for the wood splitting tasks. It comes with drop-forged carbon steel that can take any amount of stress, consistently. And at 2.7lbs, the maul is lightweight and more comfortable to handle for some people. One of the major causes of accidents when using tools is using the wrong one for a particular job. While you can use an ax to split chunks of wood to warm you during those cold days, a maul is safer and more efficient. Mauls have a bigger and heavier head than their counterparts, the ax. An 8lb maul is a standard offering, but that is not something to grieve about, but rather applaud. A more massive maul means a stronger strike on the work and less waste than a lighter one. You can sharpen an ax all you want, but its light weight will act against it, meaning more strikes on a piece, and is an accident risk. The fact that mauls are heavier than their counterparts means that they need better handles to complement the heavy head, and that is typically the case. An excellent ergonomic handle makes handling an easy task, but make sure it is longer. One ax is not similar to the next! There are different varieties on the market, and each is ideal for a particular application. So don’t fall for the notion that they are all the same – they are not! These are best for felling trees by chopping against the grain. The tools feature a sharply-honed edge that tapers to an acute angle. Its cutting surface is mostly between 3 and 5 inches and can be single or double-sided. The head is of medium weight between 2.5lbs and 3.5lbs. The handles are mostly between 28 and 36 inches – ideal for cutting down a tree. Their perfectly tapered and sharp blade is what makes them ideal for felling trees. The blade has the perfect design to make deep cuts with every stroke, making the felling of the tree easy. The ¾ ax, as some quarters refer to it, is the lightest among the different varieties of axes, that you can wield it with a single hand. The short ax was popular among the 17th-century fur traders that needed an easy to handle ax to navigate the thick underbrush they passed through. It has a light head, barely 2lbs and a short handle, between 12 and 28 inches. The Hudson Bay Axe is ideal for lighter duties such as chopping soft and small wood and lopping. It is a favorite for hunters and campers. The carpenter’s ax is a tool for those that require a cutting device for some perfection in woodworking. And similar to a Hudson Bay ax, you can use the Carpenter’s axe with a single hand. It is bigger than a hatchet, and its head can weigh between 1.5 and 2lbs. 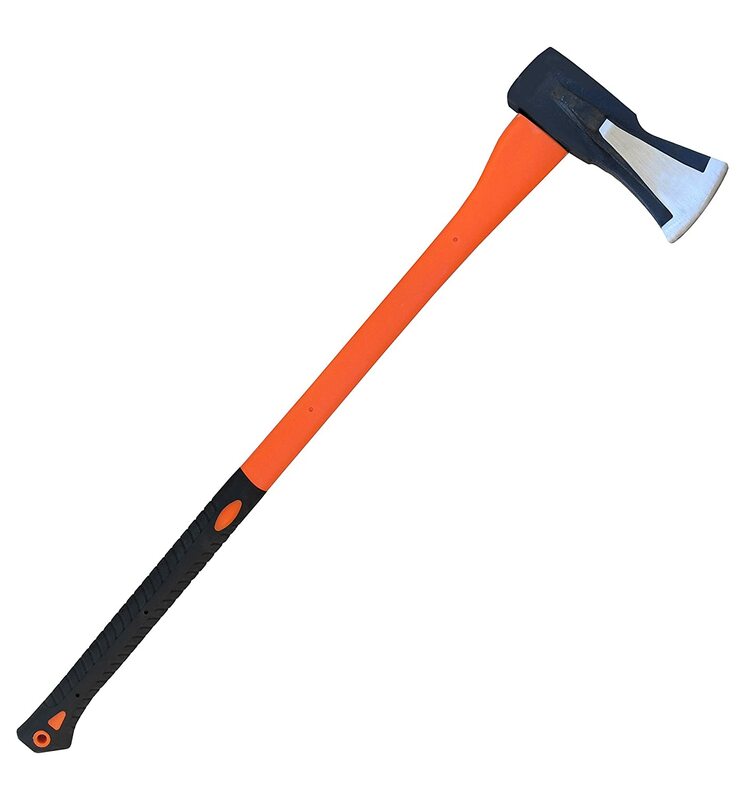 The ax has a straight cutting edge about 4 inches long and has a handle that is between 10 and 16 inches long. Choosing a maul might seem like a walk in the park, but it is a little challenging. Some of us can have the attitude that any maul is like the next and the only difference is the price – woe unto you if you are among them. A good quality maul is long lasting, and has minimal instances of accidents – critical! Handle: mauls are typically heavier than their counterparts, the axes and so they need a better quality handle. The handle should be sturdy, have a friendly grip, and most importantly, long to make splitting easy and safe. A shorter handle requires more power and is a safety risk – it is closer to your foot. Better handles are around 36 inches, but you can find smaller depending on the application and your stature.The handles can either be fiberglass or wood with the former being more durable. Hardwood such as fire-hardened hickory helps resist cracking and easily absorbs shock. Fiberglass is lighter and more durable than wood. Brand: the brands that standout when it comes to mauls include Fiskars, Estwing, and Helko Vario among others. Typically, customer’s reviews will tell you as much, and you are safer with trusted brands as opposed to a new one. Head: there is a wide variety of materials that make maul heads including steel and iron. Steel stays sharp for longer than iron. However, iron is stronger and can easily handle constants knocks with other metal. There’s nothing like a fireplace with enough wood to last the entire winter evening. The best splitting maul makes wood splitting, an easy task. 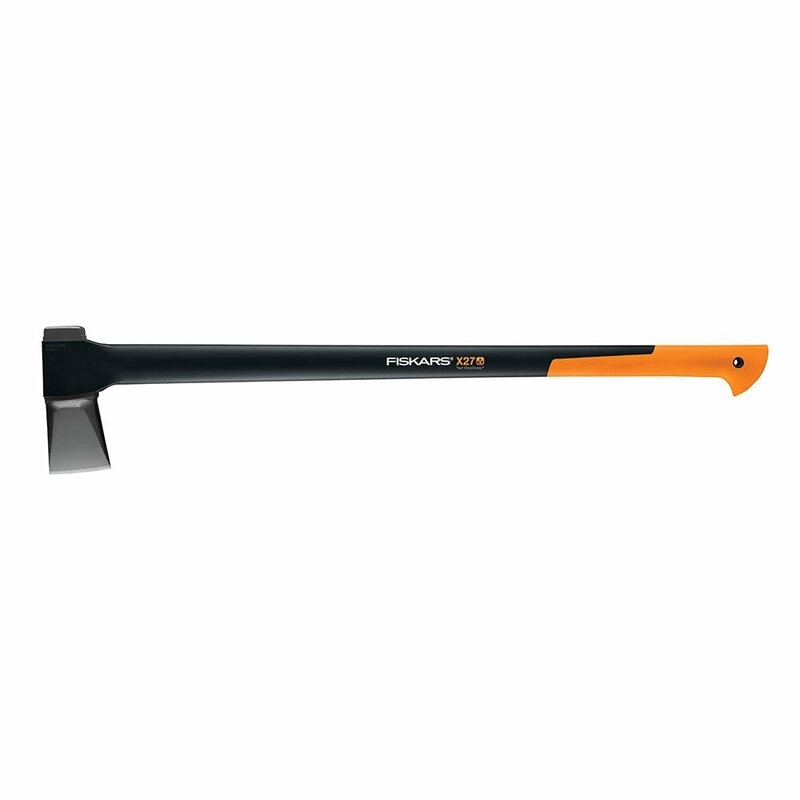 The five reviewed mauls would make a good choice, but Husqvarna 32″ Wooden Splitting Maul is a product that deserves special applause. The splitting maul features 6.5lbs head, made from the best quality metal for durability, ruggedness, and efficiency. It has a smooth hickory handle, strong enough to take constant abuse and yet remains gentle on your hands.